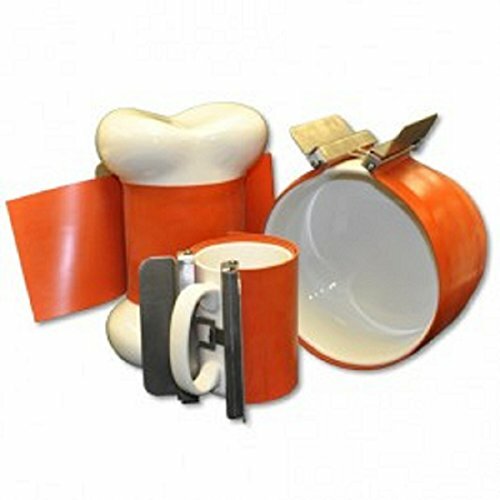 Use this adjustable wrap to decorate mugs, cookie jars, banks, or any other sublimation blank that is cylindrical. The wrap can be tightened by removing the round outer pins, setting the silicon band to the correct length with the inner square pins, and then fixing the round pins back into place. Next wrap the band around your product after taping down your sublimation transfer with heat tape (an extra piece of blank paper is also recommended) and clasp the hook into the loop opening. Your wrapped blank piece is now ready to go into the oven to be decorated. After heating in the oven, place the wrapped piece in front of a fan to cool and then unclamp the wrap and your product should be finished! After using multiple times the wrap may need to be tightened to keep achieving an air-tight wrap. No need to over tighten--as long as the transfer is held to the blank piece air tight you should get a great transfer. If you have any questions about this product by Maryland China Company, contact us by completing and submitting the form below. If you are looking for a specif part number, please include it with your message.